Over the years, I have asked many a client what they believe may be the habit that has most prevented them from attaining some sense of happiness. Overwhelmingly, the response comes down to one thing, something I call The Habit of Self-Delusion. How about this riddle for anyone who is interested, really interested in self-improvement? What’s my worst habit of all? The clear front runner is refusing to be honest with oneself. In other words, fooling myself because it means I can delay/avoid/refuse to acknowledge something. We all know that you don’t have to deal with anything, if in fact, it doesn’t actually exist. That is what I mean when I say The Habit of Self-Delusion. 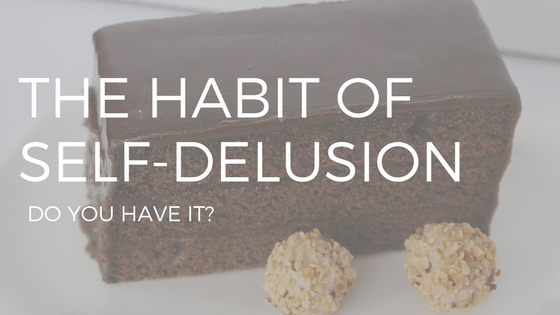 The Habit of Self-Delusion is without doubt, the one habit that causes us to experience the painful emotions of anxiety, disappointment, regret, anger and frustration more than any other. The reason this habit is the most insidious of all is it repeatedly shows up when you least expect it (or want it) and almost always leads us to one or more of the above-mentioned emotional states. This habit has remarkable persuasion skills, and uses nonsensical logic to enable us to talk ourselves into, or out of, doing what we should, or shouldn’t be doing. It helps us make the easy choice, when undoubtedly we need to be making the better, tougher choice. It is extraordinarily manipulative as it always tells us precisely what we want to hear and encourages us to do exactly what we shouldn’t be doing. It convinces us to do all the wrong things for what seems to be all the right reasons. This is the habit that kicks into gear when we are working hard to bring our weight under control and we are faced with temptation. For example, someone in the office is celebrating a birthday and, as is the company custom, a cake is brought in for all to enjoy. This is no ordinary cake. It is your favourite of all – a double chocolate cake filled with chocolate chip cookies and overflowing with chocolate covered chocolate. And you really want a sliver. Not really a sliver, a slice. Not really a slice, the whole darn thing. The habit of self-delusion starts whispering in your ear. It reminds you of how hard you have worked and deserve a reward. It tells you a little piece of cake really can’t do any harm, and besides, it convinces you to convince yourself that to make up for this piece of cake you will spend an extra four hours in the gym, really pushing yourself, each day for the next four days. All of this translates into: eat the cake. Experience has taught you that none of this will happen – except for the part where you eat the cake – but The Habit of Self-Delusion never takes no for an answer. In soothing and inspiring words, it persuades you to dive right in and make a choice you know you don’t want to make. Then, those pesky emotions mentioned above start to nag away at you and to resolve to never again allow The Habit of Self-Delusion to have any influence over you. Maybe for you it’s not about losing weight, it’s about working out in the gym, or getting up an hour earlier each morning, or spending one hour each day learning a new language, or throwing away your cigarette pack for the last time. No matter what you trying to do to bring positive change, The Habit of Self-Delusion has a nasty way of making the task more difficult. As with most habits, repeated practice has helped it entrench itself within us and it will only leave after concentrated, persistent effort on our part. I can think of no other habit that is more damaging to our psyche. So, if you are prepared to choose one habit to lose and are committed to make it disappear, this is the one to choose. Once it is out of the way, the other bad ones will begin exercising their exit strategies.